You are here: Home > News > Postcard #1: Follow Us On Our Trip to Africa! Postcard #1: Follow Us On Our Trip to Africa! 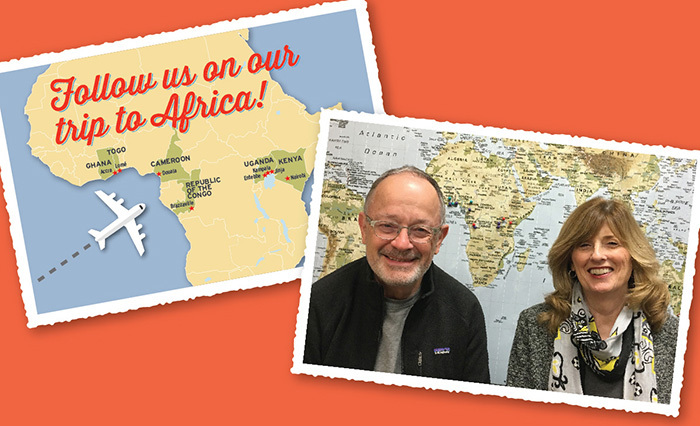 We’re on our way to Africa to meet with our inspiring students, treasured local ABF staff, and fellow Christian Scientists in six countries–Uganda, Kenya, Republic of Congo, Cameroon, Togo, and Ghana! Our journey begins mid-March and ends mid-April. We anticipate many special moments on this tour. We can’t wait to share our highlights and insights with you! 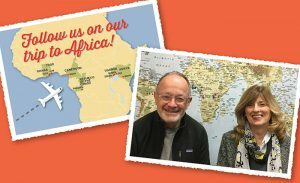 To receive our email “postcard messages” from Africa, just send an email to Carol@albertbakerfund.org, with the subject line: “Send me a postcard!” Be sure to include your full name so we know who the sender is! PS If you’d like to learn more about how our education grant program in Africa is changing lives and blessing communities, take a look at our 2016 program evaluation. This entry was posted on Thursday, March 22nd, 2018	and is filed under News. You can follow any responses to this entry through the RSS 2.0 feed. You can skip to the end and leave a response. Pinging is currently not allowed. One Response to Postcard #1: Follow Us On Our Trip to Africa!